About once a week I come across an article that claims to give “car buying hacks,” or purports to tell “secrets the dealer doesn’t want you to know.” While some of this advice is helpful, other tips are just blanket statements that maybe won’t result in you getting the best deal. Here are some “rules” that get tossed around quite often, but aren’t always helpful. I’ve covered this topic before, but the maxim persists. The concept is based on the fact that cars depreciate as soon as they drive off the lot and therefore a used car will be cheaper than a new one. The reality is that the potential savings are dependent upon the car and the market. Typically, lightly used luxury cars that are only one or two years old will save you thousands of dollars due to the fact that their depreciation curve is much steeper, but mainstream brands that have a reputation for reliability may not offer the value you are expecting. Pre-owned cars over three years old will yield more savings when compared to the brand new model. When comparing used and new prices, realize that the market for lightly used cars usually does not have a lot of markup. Due to stiff competition, some dealers price their used cars to sell quickly and may only budge a few hundred dollars or not at all. Other used car lots that are selling more of an “experience” than a deal will have pre-owned models priced higher than new ones. 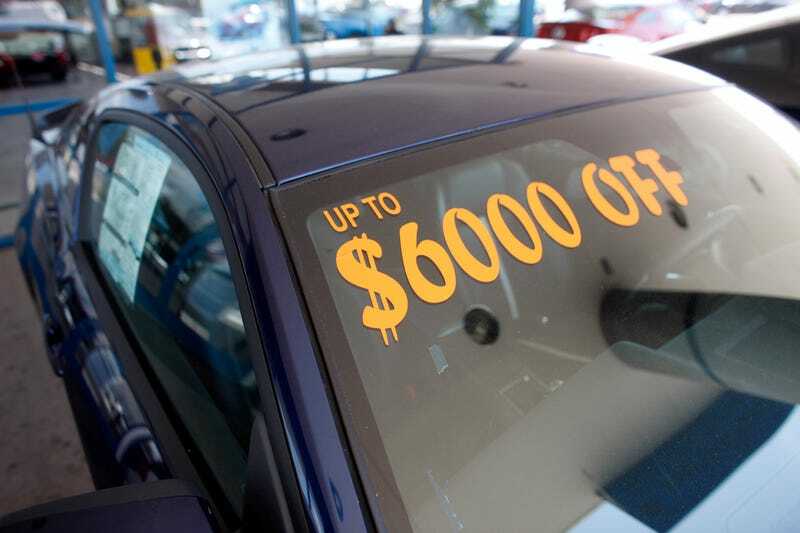 New cars usually have a greater margin for discounts, especially if the manufacturer is adding additional incentives. The key is to compare the discounts you would get on a new model to the prices of the used version. Also, realize that new car loans tend to offer lower rates so if the difference in sale price between a new car or used is $1000 or less, between the additional warranty coverage and lower APR, the smarter buy is new. On average, people that sell their car privately will make more money than trading it into the dealer. But statistical averages don’t tell the whole story. Depending on what you’re getting rid of, the potential premium you will get from a private buyer may not be worth the headache. Many states will give you a tax advantage for trading your car in; this means you only pay sales tax on the difference between the trade value and the sale price. Before you decide to trade or sell, get an offer from the dealer and run the numbers. While I was waiting for my 2015 GTI to arrive, I listed my 2010 Mazda3 for sale on various websites. I knew how much the dealer was offering and I wanted to see if I could put some more money in my pocket. Here is a text message conversation I had with a potential buyer. Anyone that has attempted to sell a car on Craigslist will relate. Buyer - I’m interested in your Mazda. will you take $9500? Buyer - Why not? I can find cars just like yours for $10,000. Me - You should buy one of those, the dealer is offering me $11,000. Buyer - What about $10,500? Me - Why would I sell you the car for $500 less than the dealer is offering me? Buyer - I have cash money. Me - So does the dealer, and it’s less hassle for more money. Buyer - Ok, I can do $11,000. Buyer - I might be able to do $11,500...can you finance me? Needless to say, I ended up trading my car to the dealer. You might make more money selling your car privately, but you need to compare the offers. The higher you list a vehicle over the $10,000 threshold it becomes more of a challenge because most buyers will have to get financing. “Experts” tell you not to take the dealer financing because the dealer can mark up the loan and pocket the difference. This is known as “dealer reserve.” While the practice is common, and some folks can get taken for a ride in the finance office, buyers with good credit are usually better off with the loan from the dealer. Dealers have access to more banks and special financing through the manufacturer. Your credit union is rarely going to be able to do better than some of the larger banks and automakers. No local lender will get you zero percent financing, as there is no incentive to offer you a loan that they make no money on. Automakers want to move units so their lending arms will give very competitive rates for those that qualify. However, if you don’t have perfect credit, a credit union or other outside financing may be the way to go. I’ve seen several instances where a dealer will tell a buyer with a FICO score under 650 that “the best they can do” is some crazy high-interest rate like 12 percent, all while that buyer was able to get approved for a more reasonable APR through their credit union. Regardless of your credit situation, you don’t want to be at the mercy of whatever the dealer offers you. Get pre-approved before you walk into the showroom. It is in the dealer’s interest to have you take their loan, so use your pre-approval as leverage for a lower rate. If they can’t give you the same rate or lower, just use your pre-approval. Some manufacturers will offer an additional cash incentive for taking what they call “special financing” (usually a slightly higher APR) or you can forgo the cash and take a lower interest rate. Those that say “always take the cash” are too lazy to run the math. I just helped a young man buy a brand new Ford Focus. There were a number of rebates available on top of whatever dealer discounts I was able to get. One of the incentives was an additional $500 customer cash if the buyer took a 3 percent interest rate instead of the zero percent for 60 months. The sale price of the car was $27,500 after taxes and fees with the $500 customer cash rebate at 3 percent APR. If he chose the zero percent route he would have had to finance $28,000. Here is where you need one of those loan calculators. The monthly payments on the $27,500 at 3 percent would be $494 a month for 60 months. If he gives up the $500 and goes the interest-free route, the payments are about $467. That is a difference of $27 a month; if you multiply that balance out over the course of the loan you would be paying an additional $1620 by taking the cash. Even if the customer finance cash was $1500, it still would have been more advantageous to take the zero percent loan. Before the age of internet shopping, the “insider tip” was to show up on the last day of the month and score a killer deal. The reason being was that dealerships have to meet a sales quota every month and in order to get their numbers they would be willing to “take a loss” on a car just to get the unit off the lot. What these “insiders” don’t tell you is that you can still end up paying too much even if you buy on the last day. Some dealerships hit their quota early, in which case they have no motivation to cut you an extra discount. Other dealers may never hit those bonus quota numbers and depend on the profit from the car to float their business, therefore, they don’t give as big of a discount as some other stores. The other issue with this tip is you don’t have time to sufficiently compare quotes. A dealer may offer you what you think is an awesome price, but the only way to know whether or not you can do better is to compare that number to the other dealers. Last month someone contacted me about a price on an Acura TLX with an MSRP of $36,929, and he said his local dealer offered him a sale price of $34,000. Since this was about $500 under invoice he was feeling pretty good about it, but still wasn’t sure. I reached out to one of my Acura contacts in his area and got a sale price of $32,500. When I presented this quote to the other dealer, they couldn’t touch it, most likely because the dealer didn’t move enough volume to build in that kind of margin on their cars. The buyer ended up taking a short drive but saved an additional $1500. In my experience, an aggressive dealer will give you the same great price at the beginning of the month as they would at the end. The key here is not to wait until the last minute and hope you score a deal, but to leverage other offers in order to force the dealers to compete. It may take up to a week or more to gather quotes and pit them against each other. Be suspicious of anyone who gives advice with using the phrases “always” and “never” because buying or leasing a car isn’t a “one size fits all” scenario. Every buyer has a different set of circumstances that will require a different strategy. The only piece of advice that won’t let you down is to shop around and run the numbers for yourself.